The Granbeat is Onkyo's first high-resolution audio smartphone | What Hi-Fi? 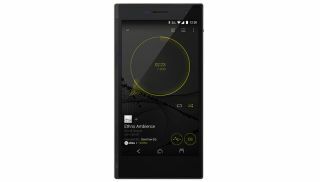 The Onkyo Granbeat DP-CMX 1 is the firm's first smartphone, and it plays a range of music files at hi-res audio quality. Onkyo might be known for its amplifiers and headphones, but the company has now dipped its toe into the smartphone world - and is bringing all its audio expertise with it. The firm's first smartphone, the Onkyo Granbeat DP-CMX 1, comes equipped for playing a range of hi-res audio files, including DSD, DSF, DSD-IFF, MQA, FLAC, ALAC, WAV, AIFF, Ogg-Vorbis, MP3 and AAC. According to the product page, this makes it possible to "sense the singer's breathing", and to hear musicians' "delicate touch" and "fine nuances". The DP-CMX 1 has its own built-in DAC to convert an analogue signal to digital, and its minimal audio circuit design is claimed to "reduce noise influence and further supresses signal degradation". It's compatible with the e-onkyo hi-res audio download service, so you can download tunes straight to the phone. And it features physical controls, so you can control your music while the handset is asleep. There's plenty of space for your music. The DP-CMX 1 has 128GB of onboard memory and accepts microSD cards up to 256GB. That means it should be able to hold around 3200 hi-res audio tracks. The phone has a 5in Full HD screen, shoots 4K video and has a Sony Exmor camera sensor. Android 6.0 Marshmallow comes as standard, and 3GB of RAM means that it should run games and videos without any slowdown. Now the bad news - it's only available in Japan, with no European launch currently planned. Still, it's another reason to book a holiday to the Far East.